While controversies like "Spygate" and "Deflate-gate" have hurt the reputation of the team, it is hard to dispute the on-field accomplishments of the New England Patriots since 2000. Tom Brady and Bill Belichick made the Patriots arguably the top overall team of the new millennium and collectors have shown strong interest. While earlier teams did not enjoy the same level of success, there are also plenty of top vintage rookie card options. 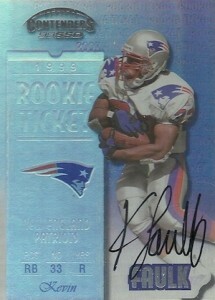 The following guide highlights the top New England Patriots rookie cards of all-time. Because of the different collecting eras in the hobby, the list is split between vintage and modern rookie cards. The vintage guide covers all New England Patriots rookie cards before 1980 and can be seen below. The vintage rank is largely based on actual card values, but overall significance is taken into account when values are close. As many collectors know, card condition can cause extreme fluctuations in value, and this especially true for vintage cards. Click the tab above to see the top modern New England Patriots rookie cards. A top linebacker for the Patriots in the 1980s, Steve Nelson played his entire 14-year career in New England and his number was retired by the team. Nelson was a three-time Pro Bowl selection and helped the team reach their first Super Bowl. His 1978 Topps rookie is very inexpensive. 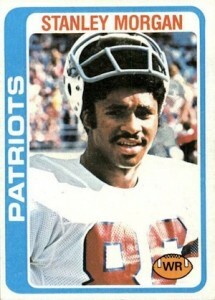 Stanley Morgan went to four Pro Bowls while with the Patriots and is one of the best wide receivers in the history of the team. His rookie is also in 1978 Topps and is normally found for just a few dollars. A defensive terror for the Boston Patriots in the 1960s, Jim "Earthquake" Hunt was primarily a defensive tackle for the team and was a four-time AFL All-Star. 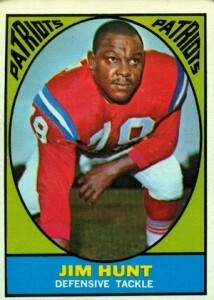 Hunt's number was retired by the Patriots and his budget rookie is found in 1967 Topps. 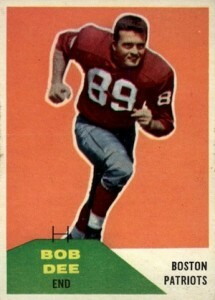 Another strong defensive lineman for the Patriots in the 1960s, Bob Dee was a four-time AFL All-Star and also had his number retired by the team. His rookie is located in the inaugural AFL product, 1960 Fleer. 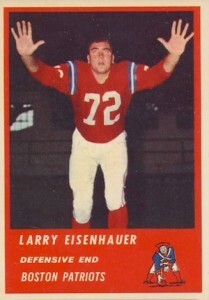 Larry Eisenhauer was an elite defensive end for the Boston Patriots and a four-time AFL All-Star. 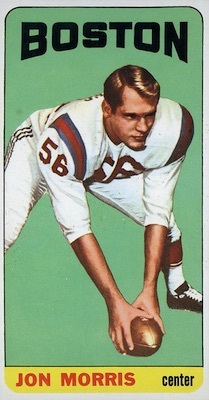 The red-heavy design in 1963 Fleer works well with the Patriot's color scheme on Larry Eisenhauer's rookie card. Renowned for his toughness, Steve Grogan was with the Patriots for 16 seasons and was the primary starter for seven of those years. An accomplished running QB and fan favorite, his rookie is found in 1976 Topps. The older brother of Randall Cunningham, Sam Cunningham was a strong running back for the Patriots in the 1970s. "Bam" was selected to one Pro Bowl and remains the all-time leader in career rushing yards for New England. 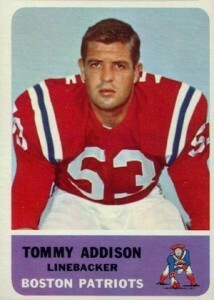 A five-time AFL All-Star in his eight years with the Patriots, Tom Addison was one of the top linebackers in the league during the 1960s. His 1962 Fleer rookie has a very similar design to 1963, except the border is white. 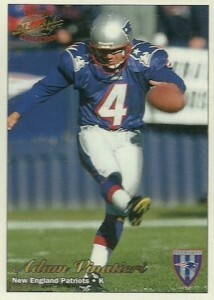 The top center in team history, Jon Morris was a six-time AFL All-Star and one-time Pro Bowl selection for the Patriots. His rookie in 1965 Topps is part of the famed tall boy set that is also home to the Joe Namath rookie card. One of just a handful of Patriots in the Pro Football Hall of Fame, Mike Haynes was a six-time Pro Bowl selection for New England and his number was retired by the team. 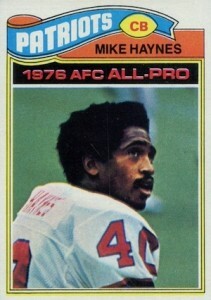 In addition to being one of the best cornerbacks of his era, Haynes was also a top punt returner. His 1977 Topps is a terrific budget HOF option. 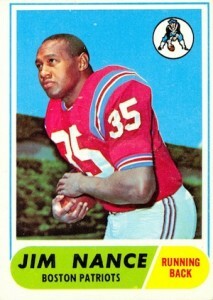 Not to be confused with broadcaster Jim Nantz, "Big Jim" Nance spent most of his career with the Patriots' franchise and was a two-time AFL All-Star and league MVP in 1966. 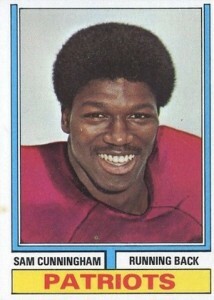 Collectors can find the rookie card for the strong running back in 1968 Topps. A six-time AFL All-Star defensive tackle for the Patriots, Houston Antwine was an accomplished pass rusher. Collectors can find his rookie in 1964 Topps. Arguably the best offensive lineman in league history, John Hannah was the first Hall of Fame player for the Patriots and had his number retired by the team. Hannah spent his entire 13-year career with New England and was a nine-time Pro Bowl selection. His 1974 Topps rookie is the point in the vintage list where values start to pick up. 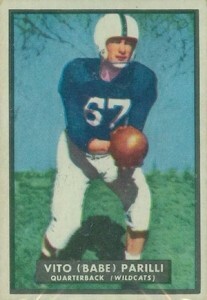 Vito "Babe" Parilli played for several teams in his career but the bulk was spent with the Boston Patriots. 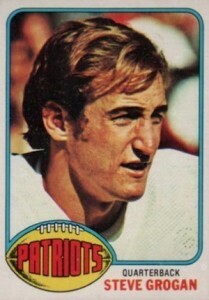 Parilli was one of the first quarterbacks for the Patriots and a three-time AFL All-Star. His rookie in 1951 Topps Magic is the oldest option on the list. Although he played longer for the Miami Dolphins, Nick Buoniconti had many of his best years in New England. 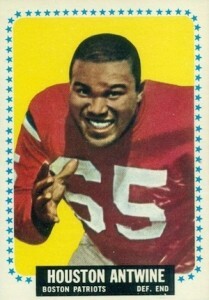 He was a top linebacker for the Patriots in the 1960s and was a five-time AFL All-Star with the team. Collectors can find his HOF rookie card in 1963 Fleer. The top vintage rookie card for the Patriots, Gino Cappelletti is known to many as "Mr. Patriot." 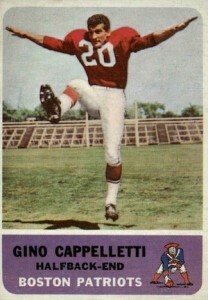 Cappelletti was a wide receiver and kicker for the team and a five-time AFL All-Star. He also was named the 1964 AFL MVP and his number was retired by New England. His 1962 Fleer rookie is reminiscent of the crane kick from Karate Kid. The golden era for the New England Patriots began in 2000 with the hiring of Bill Belichick and really took off when Tom Brady assumed the starting role in 2001. Since then, the team has made 12 playoff appearances and six trips to the Super Bowl. Although there are not any huge collecting names outside of Brady, the Patriots offer quite a few appealing options for modern rookie collectors. 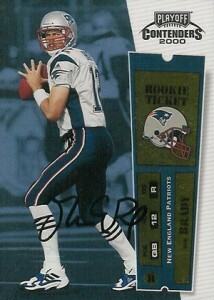 The following list features a list of the top Patriots rookie cards since 1980. Given the fundamental change in the hobby during that period, the ranking is largely based on the player's overall significance. A do-it-all player for the Patriots, despite not receiving any individual accolades, Kevin Faulk is remembered fondly by the fan base. Collectors have over 50 choices when it comes to Kevin Faulk rookies, but his Contenders rookie is the top option as it is the only signed option. 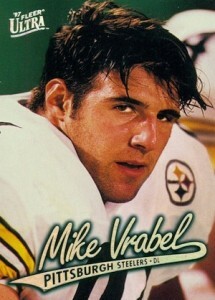 Mike Vrabel was a one-time Pro Bowl selection at linebacker and won three Super Bowls with the Patriots. He only has one rookie card and collectors can find it in 1997 Ultra. While he has put forth another impressive career with the Indianapolis Colts, Adam Vinatieri was a two-time Pro Bowl selection for the Patriots and made some really big field goals for the team. His only rookie card is found in 1997 Pacific Philadelphia. A two-time Pro Bowl selection and three-time Super Bowl champion with the Patriots, Willie McGinest played a variety of defensive positions in New England. 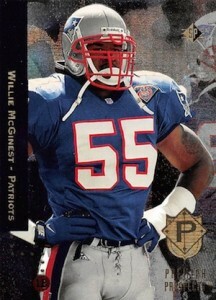 There are over 20 base rookie cards for McGinest and 1994 SP is one of the best choices. 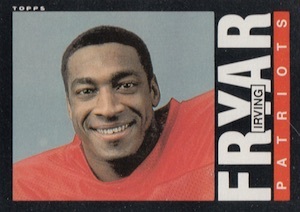 Although many of his best seasons happened with other teams, Irving Fryar was the top overall pick in 1984 by the Patriots and is one of the top receivers in team history. Fryar went to one Pro Bowl for New England and his rookie in 1985 Topps is a popular option. After starting his career in San Diego, Rodney Harrison played a pivotal part of the New England secondary for six seasons. 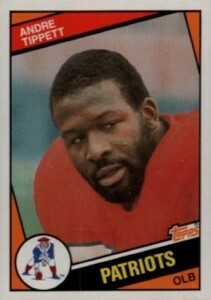 Harrison was part of two Super Bowl wins and his 1997 Finest card is the top choice among his five rookies. 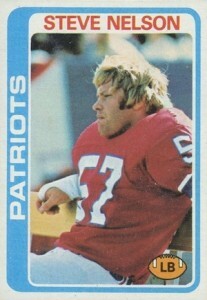 A six-time Pro Bowl selection, Bruce Armstrong spent his entire career in New England and his number was retired by the team. His 1989 Score rookie card can be found for just a few dollars. A dominant defensive tackle for many years in New England, Vince Wilfork continues to anchor the defense and is a five-time Pro Bowl selection. 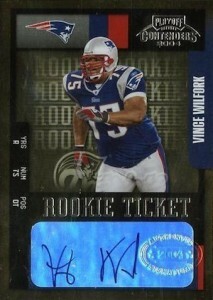 His 2004 Contenders rookie card is one of several signed options and arguably his most popular. One of the top receiving threats for the Patriots and Tom Brady over several seasons, Wes Welker was a five-time Pro Bowl selection and totaled 100+ receptions in five of his six years in New England. 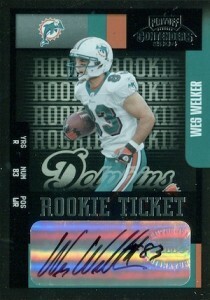 Collectors have a few options for Wes Welker rookie cards, but his top card is a signed rookie from 2004 Contenders. Rob Gronkowski has already earned a spot on the all-time list based on his elite play in just a few seasons, but could see a huge jump if he can maintain his production. Among the top tight ends in the league, Gronk's best rookie card is found in 2010 National Treasures. One of the all-time fan favorites for the Patriots, Tedy Bruschi won three Super Bowls in New England and was the 2005 Comeback Player of the Year. 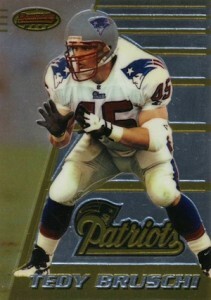 Bruschi only has three rookies and his Bowman's Best card is the top option for collectors. 1996 Bowman's Best is also the place to find the top rookie card for Lawyer Milloy, another notable player from the Patriots' defense. 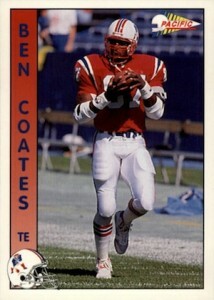 Although Rob Gronkowski gets more recognition than any other tight end for the Patriots, Ben Coates was an elite tight end in the 1990s and was a five-time Pro Bowl selection. His 1992 Pacific rookie card is classic 1990s goodness. Curtis Martin spent the early part of his Hall of Fame career with the Patriots where he won the 1995 Rookie of the Year Award and was a two-time Pro Bowl selection. 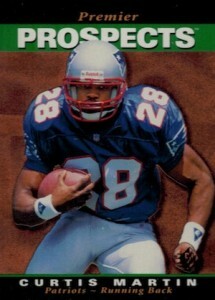 Collectors have several Curtis Martin rookies to chase and his most popular card is found in 1995 SP. Troy Brown was not the flashiest player to suit up for the Patriots, but he is a fan favorite based on his long career and many contributions to the team. Brown has the second-most receptions and receiving yards in team history and was also a dangerous punt returner. 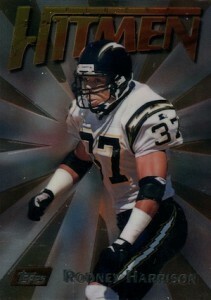 His only rookie card is found in 1993 Action Packed. Before Tom Brady, there was a fellow by the name of Drew Bledsoe. The Patriots added the strong-armed quarterback with the first overall pick in the 1993 NFL Draft and he was a three-time Pro Bowl selection before an injury opened the door for Brady to supplant him in 2001. Although he never regained his starting spot, Bledsoe played an important role filling in for an injured Brady during the playoffs the same season that the Patriots won their first Super Bowl. 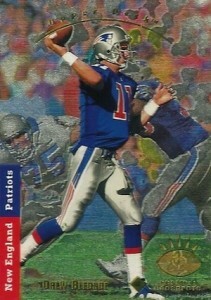 Over 20 rookie cards are available for Drew Bledsoe and 1993 SP is the top option. Despite playing just three seasons for the Patriots, Randy Moss put forth over 1,000 yards and 14 touchdowns in each season with New England and is the most talented receiver Tom Brady has ever had. 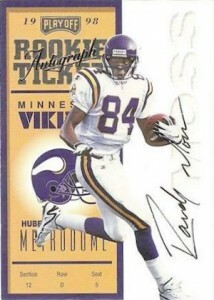 His rare 1998 Contenders autograph is the top Randy Moss rookie card option. Although the abrupt trade that sent Richard Seymour to the Raiders surprised many people, his time in New England is still very notable. Richard Seymour was a five-time Pro Bowl selection for the Patriots and part of three Super Bowls championship teams. 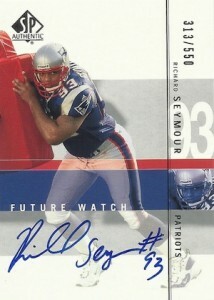 Seymour has two signed rookie cards for collectors to chase, but his 2001 SP Authentic is the most limited option. 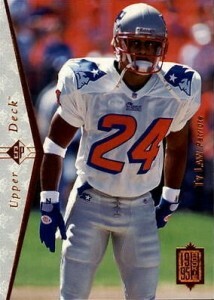 One of the top Patriots defensive backs of all-time, Ty Law was a four-time Pro Bowl selection in New England and a three-time Super Bowl champion. 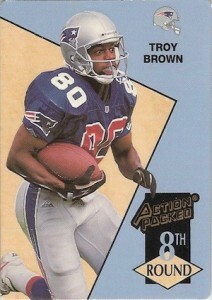 There are 11 rookie card options for Ty Law but his 1995 SP has emerged as the top card for collectors. One of the most dominant linebackers of the 1980s, Andre Tippett was a five-time Pro Bowl selection for the Patriots and one of the best defensive players in the team's history. 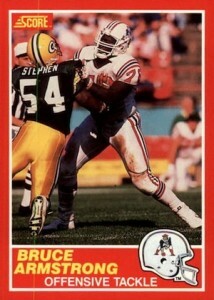 Collectors can find the rookie card for the Hall of Fame outside linebacker in 1984 Topps. Who else could be number one? Tom Brady is the face of the franchise and a huge reason for the success the Patriots have seen since he became the starter. As one of the all-time greats at the quarterback position, Tom Brady is among the top overall options in football collecting and his 2000 Playoff Contenders rookie card leads the way. 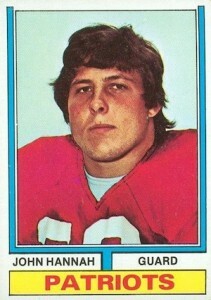 Trey, we found some old football cards (about 60) that go back to the early 70’s. Their not Topps brand but appear to be regular football cards. My wife recognized one player, Lyle Blackwood (safety for the Bengals 1976) whom she went to high school with. We are wondering what they may be worth and if you are interested?